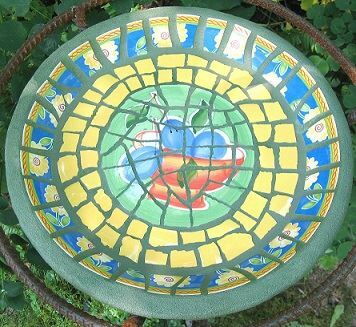 Students will create a mosaic birdbath to take home to their garden. 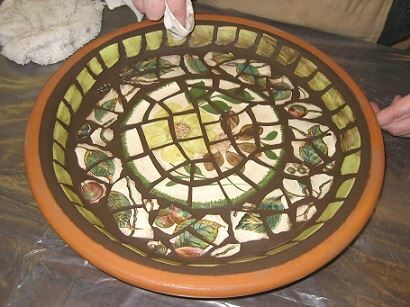 The class is designed to teach techniques including base material selection, mosaic design, cutting dishes and tiles to create the visual elements of the mosaic, setting the pieces with mortar, and finally grouting the piece utilizing a traditional mortar and grout process. A materials fee of $45 is included in the price of the class. The materials fee covers the cost of the terracotta base, all tools, materials and supplies including a variety of dishes and tiles, mortar, color tint, and grout. Students may bring china or pottery dishes or tiles for possible inclusion in their bird bath. Darcy Thompson has taught mosaic classes for the Schack Arts Center in Everett, Bassetti Gardens in Woodinville as well as private classes. She has been a working artist for over 20 years and shows her work at a variety West Coast art shows including the Bainbridge Island Studio Tour as well as in various galleries. She is entirely self taught and loves to teach the varied steps in the process of re-purposing cracked or broken plates into fun and colorful mosaics for the home and garden.